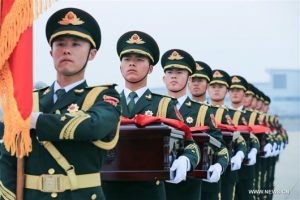 The day North Korean dictator Kim Jong-Un paid a surprise visit to Beijing, the South Korean government conducted a large ceremony at the Incheon International Airport to return the remains of 20 Chinese communist soldiers killed during the Korean War nearly 70 years ago. On March 26, South Korea’s Defense Minister Song Young-Moo presided at the ceremony and said he hoped such continuous goodwill moves by the South Korean government would bring China and South Korea closer and facilitate cooperation. The return of remains initiative was started by former ROK President Park Geun-Hye in 2013 when she developed a cozy relationship with the Chinese leadership. To show her gratitude to her Chinese host during an official visit to Beijing, Park promised to return remains of Chinese communist soldiers killed in the Korean War and buried in what is now South Korea. The first batch of 437 soldiers’ remains was returned to China in 2014, followed by 68 soldiers’ in 2015, 36 in 2016, and 28 in 2018.